Oops, I'm back to food again. Yes, rather many posts on the cruise and its food, I know. I've also exceeded the 5 posts required, and it's already past our deadline. But there's just so much I want to remember. 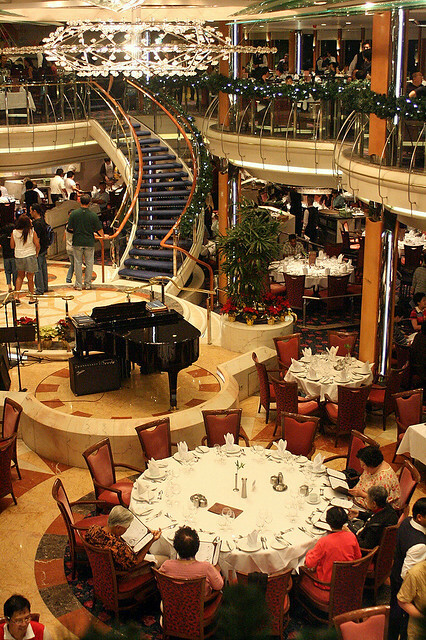 Can you believe the bloggers who went on the cruise last month are still reminiscing about Windjammer Cafe and Romeo & Juliet fine-dining meals? Sometimes at 6.30pm, we'll tell each other, "Hey, dinner's open now at Windjammer...wonder which lucky passengers are eating there now!" 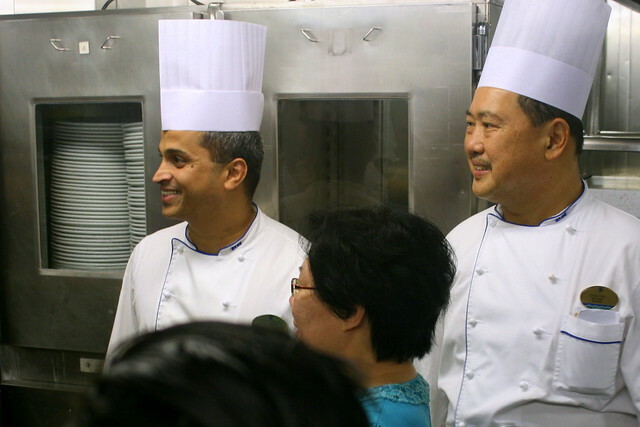 Kudos to Executive Chef Suresh Balal (left) for overseeing the astounding 12,000 meals that the kitchen churns out each day on board the ship. This is way more challenging than running a restaurant or even a hotel eatery. They run through a whole container load of produce each week. The 120-odd kitchen crew work really hard. We thought perhaps they run on shifts, but no, they just take breaks. And yet they manage to maintain a certain level of quality and consistency in the food. We really enjoyed the kitchen galley tour Suresh gave - very clear, informative and authoritative. 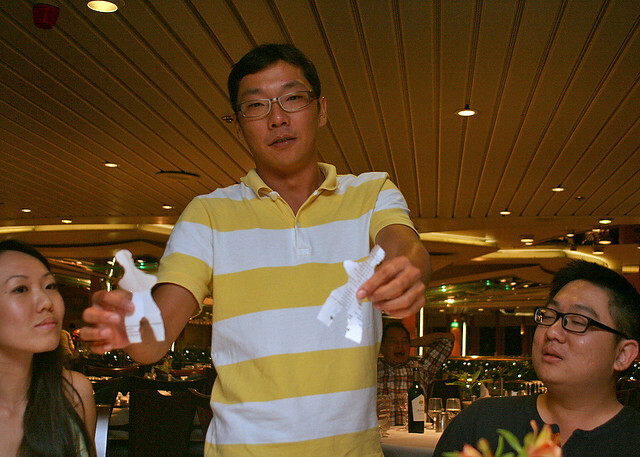 Here he is with one of his chefs Chin Tan (right) from Malaysia. 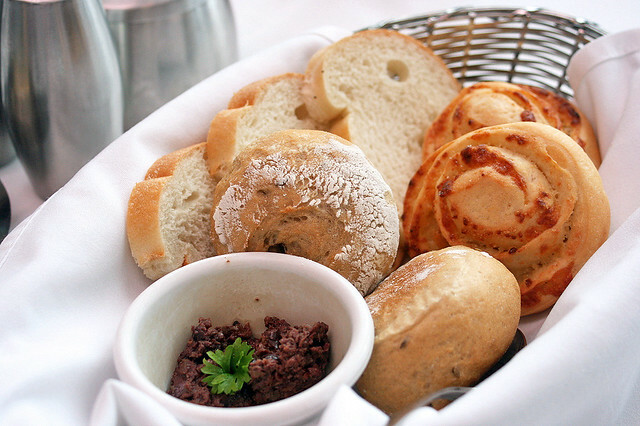 Ah, the bread rolls we get at Romeo & Juliet. Baked fresh daily on board the ship itself. There's even a special machine in the kitchen that transforms a large pile of dough into many little rolls to be baked. Here's the lunchtime salad bar at Romeo & Juliet. These guys will put together a salad according to your preferred ingredients. And they are not mean with portions, even when you tell them you want just a little bit! See? This salad is almost a full meal in itself. 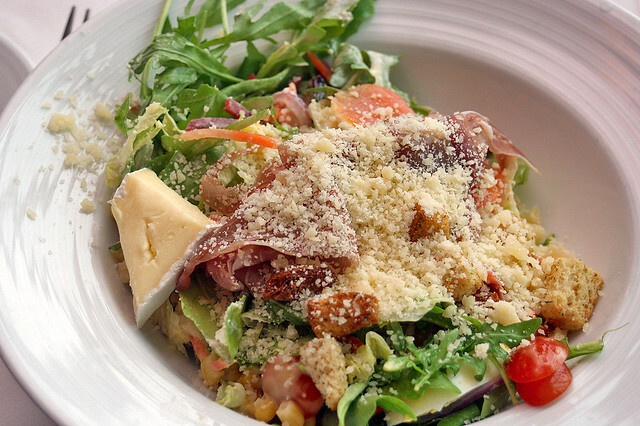 Rocket and crisp lettuce greens heavily smothered with smoked salmon, cured Italian ham, croutons, tomatoes and cheese. 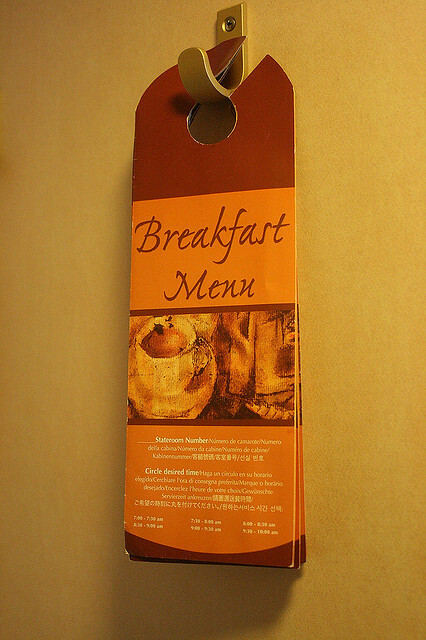 Romeo & Juliet also serves breakfast but we only tried it on the final day, right before departing the ship. 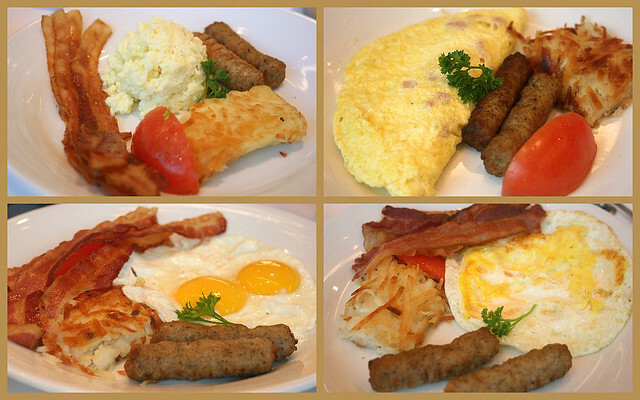 Different styles of eggs with bacon, hash brown and sausage, along with fruit, blueberry pancakes, French toast and some pretty good coffee. 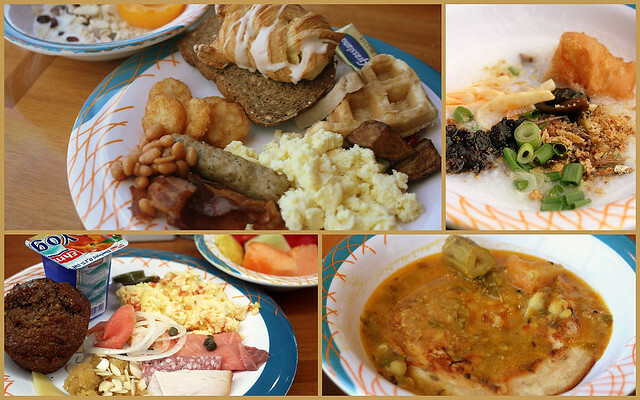 Nice as it was to be served, I still prefer assembling my own breakfast at Windjammer Cafe. There's a much wider variety to choose from, and you can have a bit of everything. Besides the ham, cold cuts, smoked salmon bacon and eggs, there's congee, fruit muesli and yoghurt, and even Indian sheera, sambhar with prata or chapati. And of course lots of breakfast rolls and pastries. You should try breakfast in bed someday, it's pretty good. I saw photos from Calvin. And hurray! 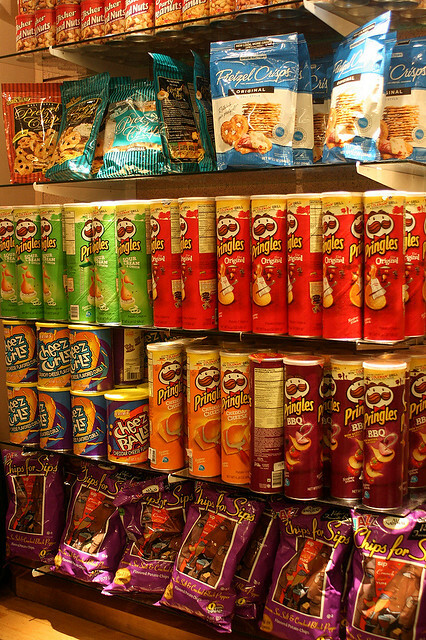 You can buy U.S. made Pringles on board! Royal Caribbean is based in Miami, so they stock a lot of U.S. snacks and products! But even better than Pringles are the papadums! Windjammer serves them by the boatload. There's always a fresh batch because they keep topping up (and people keep taking them!). Irresistible! 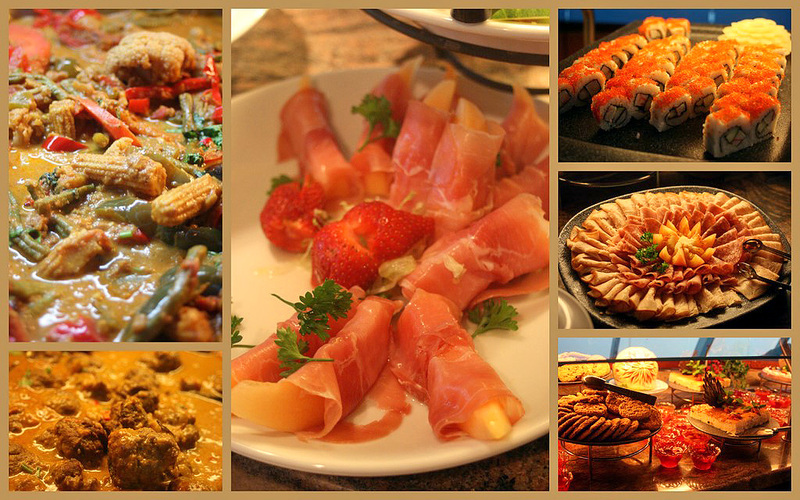 We often have a small platter to share while having our meals. Alvin confessed that he sneaks back to Windjammer after dinner just to munch on these! 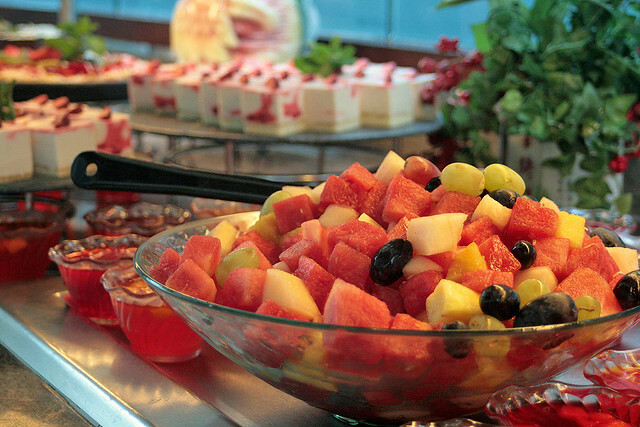 Don't worry, there's also lots of fruit every day to help balance all that unhealthy snacking. Freshly cut, sweet and juicy! It's just dangerously close to the desserts! Ah, our sit-down dinners at Romeo & Juliet, where we regroup and share how our days went. 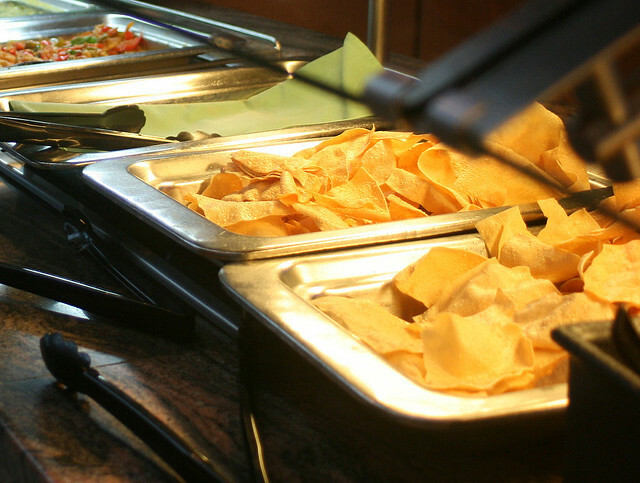 By the way, we often take a sneak peek at Windjammer first to see what's on for tonight (the kitchen also makes similar items for the buffet but portions and presentations differ). 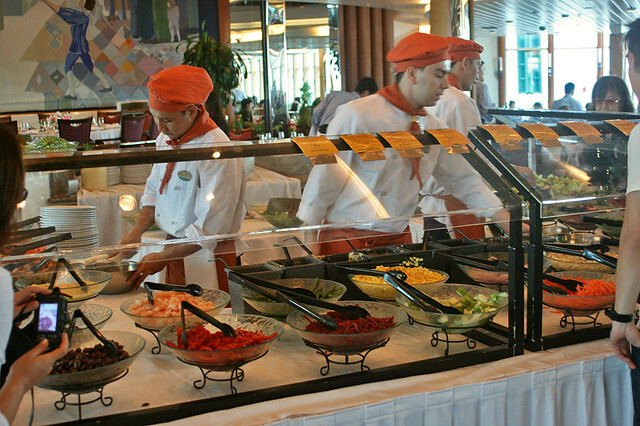 I think the Royal Caribbean staff must have been shocked to see us eating twice. Here's what we had for our Day 4 final evening dinner at Romeo & Juliet. 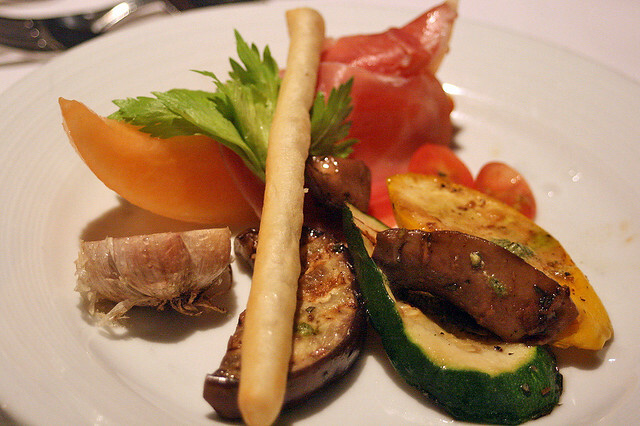 Antipasti of cured Italian ham, seasonal melon, grilled vegetables, marinated portabello moshrooms and baked caramelized garlic! So lovely it looks! 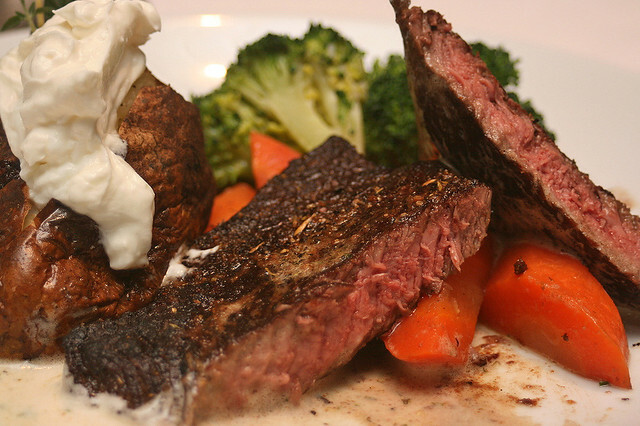 Black Angus Top Sirloin - grilled to order, topped with herb butter and served with garden vegetables. Beef makes a regular appearance as the main. 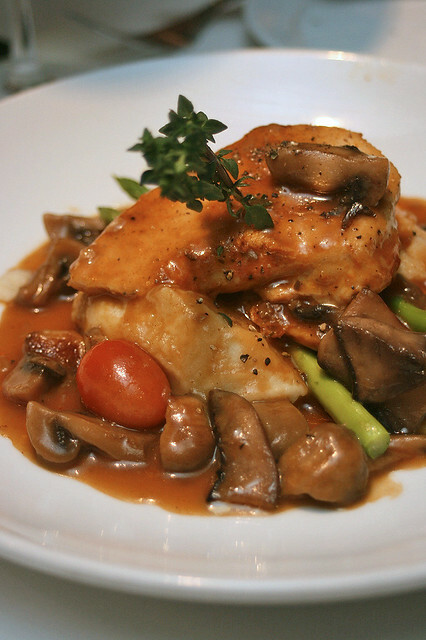 Chicken Marsala - sautéed chicken scallopine nestled in Marsala mushroom sauce, served with buttery mashed potatoes and fresh vegetables. I didn't get to try but heard this was good. 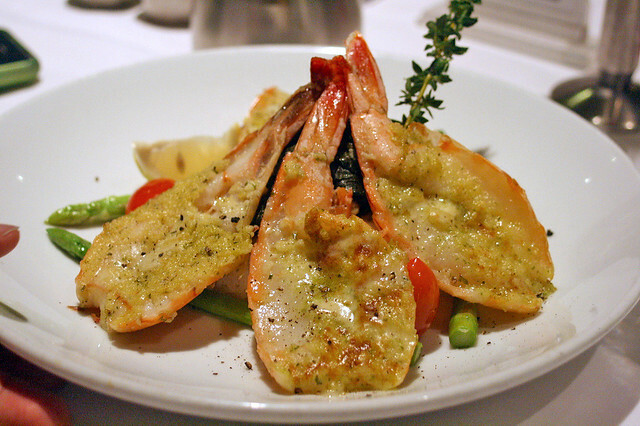 Garlic Tiger Shrimp sauteed in garlicky herbed butter, with rice and seasonal vegetables. 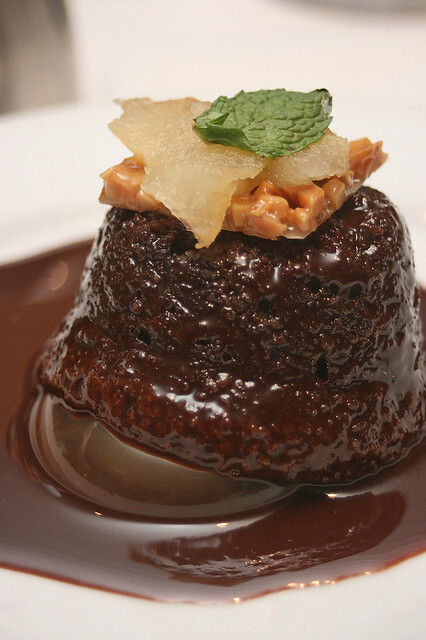 Warm Chocolate Cake (vegetarian) with milk chocolate sauce and sweet roasted pears. No, I don't know how that bubble got there at the bottom. But this was delicious. 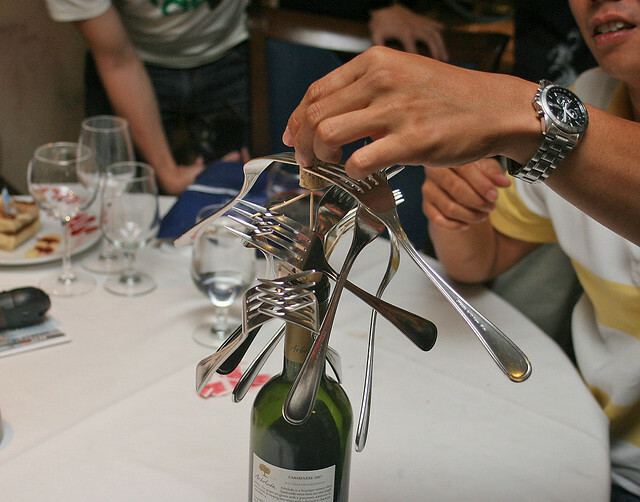 After dinner, we had party tricks like how to balance a bazillion forks on a bottle with just four toothpicks. Our cameraman managed to figure it out! Indeed, food is most fun when it's with friends. I don't know whether it's rose-tinted glasses, but I seem to miss the cruise more as days go by. OK, I still have one final post to go. I promise to get to land-based food soon. My backlog is even heavier than before! p.s: what was Alvin thinking? Congratulations to winner of Ben & Jerry bike!